The pie iron comes in many shapes and sizes for cooking many different types of food. 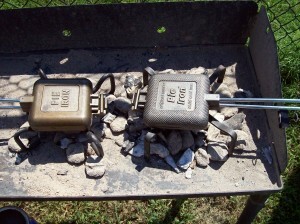 The most common pie irons are the square single serving ones made from cast iron. They are made by diifferent manufacturers in cast iron, aluminum and / or steel and some are available with a nonstick coating. Each pie iron comes with long handles and a latch to keep it closed during cooking. The pie iron has many names depending on where you come from: Mountain Pies, Pudgy Pie or Pudgie Pies, Sandwich Cooker, Hobo Pies, Tonka Toasters and Pie Shams. 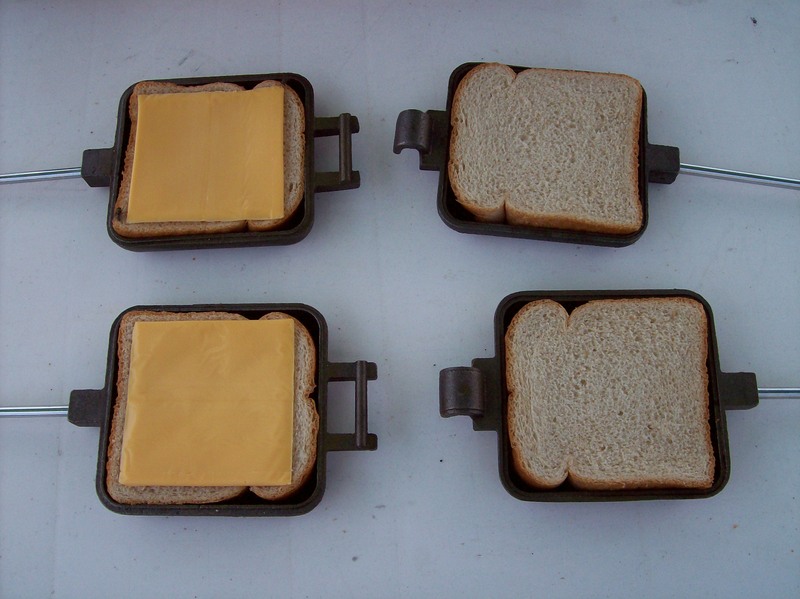 In the United Kingdom, a pie iron or pie iron cooked sandwich is known as “Toasties” Italians call them “Panini Grills” Australians call them “Jaffle Irons”. The best pie irons are made of cast iron and create a better toasted sandwich. The cast iron pie irons are heavier with better heat distribution along with durabilitiy. 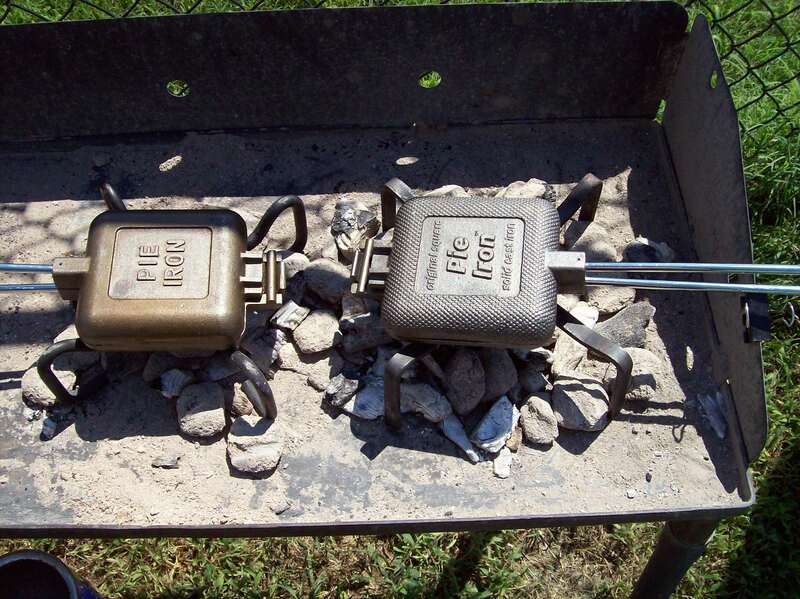 The pie irons are seasoned the same way as other cast iron cooking utensils. If properly cared for they can last a lifetime. The more you use them the blacker and better they get, eventually forming that nonstick coating or petina as its called by cast iron lovers. What can I cook in a Pie Iron? The recipes you can make are endless. You are only limited by your imagination. Anything you can make at home can be recreated in a pie iron, just on a smaller scale. 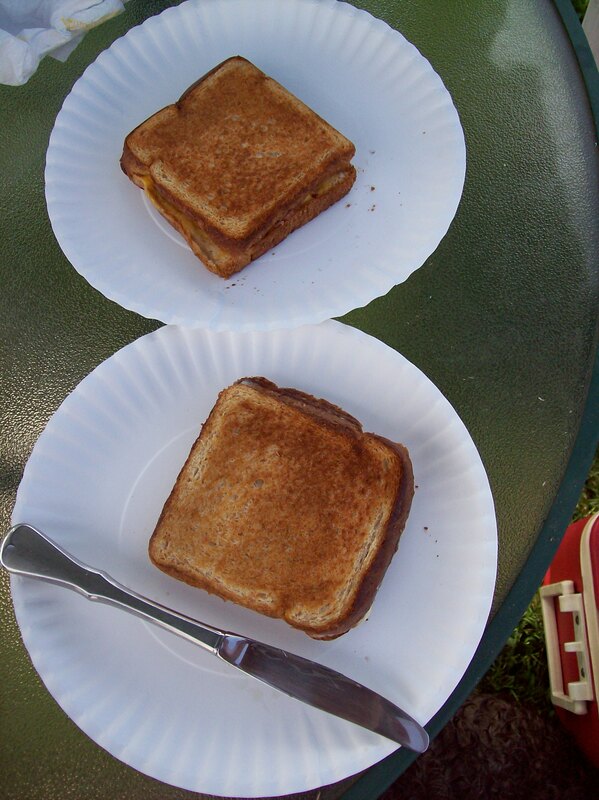 Cooking together brings a family closer while giving each member of the family the chance to make something different, his or her own personalized toasted sandwich or fruit pie. Please send us your recipes and pictures. We would like to see them. Pie Iron Basic Instruction Continued . . . . .